Design for luxury is so intriguing, particularly because so much of it is based on building a unique brand experience for consumers, apart from the product. It caters to a select group, and getting access to that group is much like being let into an exclusive private club. It was precisely the mood I was hoping to evoke when designing packaging for a set of high-end champagne flutes. By incorporating a sense of mystery and wonder into the unboxing experience, the act of sipping champagne could be elevated even more. Champagne flutes get the VIP treatment. Create packaging for a set of four to six glasses. Research an existing chosen brand and design for its target audeince. The packaging must reflect the chosen company and offer ease of use and adequate protection for the glasses. After deciding to focus on the high-end market, the German glassware maker Sieger was selected as the brand for my glass packaging. Color schemes, typography and box construction concepts were subsequently inspired by the exclusive world of VIP clubs. 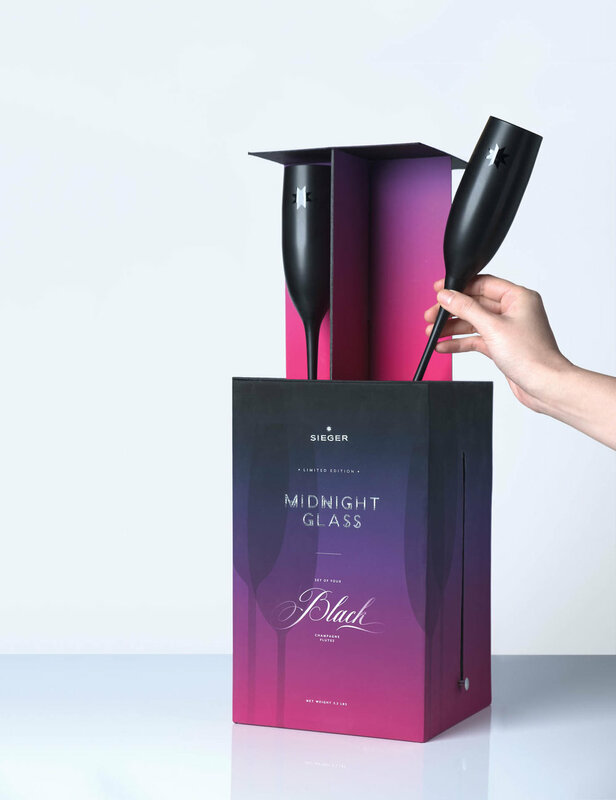 Through vigorous in-class feedback and prototyping, I created a box with a disguised opening and a lever system for a set of four long-stemmed black crystal champagne flutes. Pushing down on two discrete steel knobs on the sides of a flat-topped box allowed an elevator-shaft-like interior to emerge, revealing the glasses within.